Become a Water Warrior! Be a part of an International Multi Media Art/Activism Project in Gaza City! We need to raise $600 a day until August 14th to meet our goals for materials and media production! Help spread the word to your networks: See sample tweets below. Click for more information Maia Mural Brigade MAIA Mural Brigade website will open in a new window. 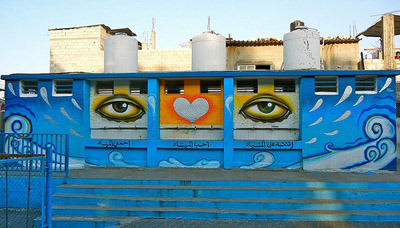 The MAIA Mural Brigade ~ Maia means Water in Arabic, brings an international team to Gaza to create collaborative murals about the universal right to water. The project was organized with Middle East Children’s Alliance and Afaq Jadeeda in response to a Youth Council decision in Gaza that lack of clean water was a priority problem. The MAIA Mural Brigade included activists, trauma therapists, muralists, filmmakers, MECA, Estria Foundation Water Writes Project, Olympia-Rafah Solidarity Mural Project and Afaq Jadeeda (New Horizons) 8 murals were completed in 2011 at the sites of water filtration systems installed by MECA; providing clean drinking water to 35,000 children.